PM Modi charged the opposition of "neglecting people" by not completing irrigation projects "on time"
Prime Minister Narendra Modi accused the earlier UPA government of leaving "incomplete projects throughout the nation during its tenure." 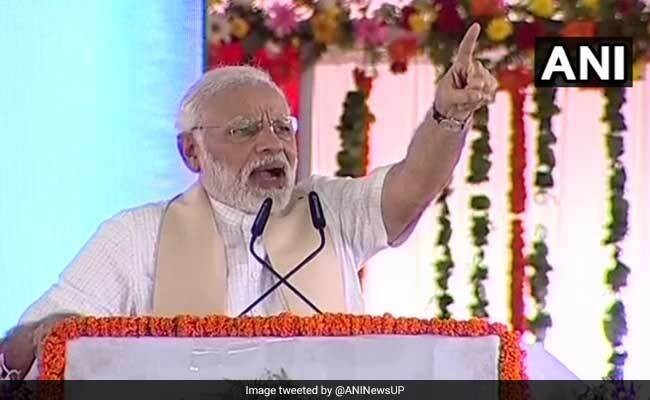 On the second day of his two-day visit to Uttar Pradesh, Mr Modi was addressing a public meeting at Mirzapur, after inaugurating the mega Bansagar canal project on Sunday. "Those who are shedding crocodile tears for farmers today should be asked why they did not complete irrigation projects, which were left incomplete throughout the nation during their tenure," said Mr Modi. He charged the opposition parties of "neglecting the people" by not completing projects "on time." "Had this project (Bansagar) been completed beforehand, you would have been benefited by it two decades ago," said Mr Modi. The Prime Minister heaped praises on the BJP government in the state saying, "Since the time Yogi Adityanath has led the government, the eastern zone is being paid adequate attention for all round development." This is the Prime Minister's second visit to eastern UP in just over a fortnight. The visit is being seen as a bid to cement ties with ally Apna Dal (S) that has considerable influence over the OBC vote bank in its stronghold in Mirzapur. On Saturday, Mr Modi visited Varanasi and Azamgarh. Sources in the BJP say, the party wants to further cement its base in eastern UP before the 2019 parliamentary polls, and one way to do this is to boost infrastructure projects in a big way. In Azamgarh yesterday, the Mr Modi laid the Foundation Stone of the 340-km long Poorvanchal Expressway, which will connect several high profile towns of eastern UP including Barabanki, Amethi, Sultanpur, Faizabad, Ambedkar Nagar, Azamgarh, Mau and Ghazipur, with the state capital Lucknow.